We have been providing custom mapping and data creation services since 1998. Over this period, a number of questions have been asked regularly; we hope these quick notes address a lot of them! Are you are the person who needs the map, or are you searching on behalf of someone else? It is common for initial contact to be delegated – normal and routine, usually with a satisfactory outcome. Occasionally though, the person making first contact may be unclear about exactly what you have in mind. When we ask the inevitable questions about detail, they sometimes cannot be answered by the delegated person, who then faces a potentially awkward position regarding completion of the delegated task. What is your geographical area of interest? For example one or several States / Territories, just a “regional area” e.g. the “Illawarra” region of NSW, all of Australia or other parts of the world? If you already have a map outlining your area of interest, consider marking the corners of your area, taking a photo and forwarding in an e-mail. Providing we can recognise a few localities, this can be a great help when offering estimates of data costs for example. are you thinking of something more dynamic, allowing users to directly interact with and / or modify / update data (you may find our digital mapping technology overview page of interest)? Increasingly, geographical data and mapping applications can be delivered directly via a web browser, get in touch for more information. Whether you require a tabular summary of analysis, rather than / in addition to map graphics. If you wish to have your own in-house data analysed or integrated, please consider preparing a sample (remove any sensitive / identifying data if appropriate) as either a spreadsheet or “csv” file and attaching to an e-mail; we will supply you with feedback on format / suitability without obligation. Do you envisage any future updates, for example an annual revision of sales records? While not essential, it gives us the opportunity to indicate what such updates may involve; an update can often be a relatively quick exercise, especially if we are able to build the option into your initial project structure. Maps we create for our clients are unique, they're custom maps. To make a comparison, a custom mapping task is like a suit made for you by a tailor. It will fit you and your needs exactly. Nobody else will have one like it. If you can meet your clothing needs off the peg – that is from a store in the high street, it will be cheaper than hiring a tailor to dress you. If you have read this far, it is almost certain you have already approached your local map store, government agency, library, or opened an atlas, and now recognise that the map(s) or map derived data you desire and have in your mind’s eye don’t already exist (although if you are looking for Australian Postcode maps, you’re in luck)! Custom maps - what usually happens to make one and your own role in it.. Initiating a custom mapping job. Please see our standard terms and conditions where these are specified. In summary though, standard rates range from A$140 per hour; a rate similar to a typical suburban plumber. Except for an initial draft map, we have a minimum charge of $175 ex tax. We charge pro-rata, so you only pay for the time we spend on your work. We feel this is a lot fairer than many other professionals, who will charge in increments, for example in 15 minute increments (even if you only use a minute or two of the increment). You will need to complete and submit the form on our terms page before we commence your project. What to expect during your project and your own role in it. Once you have engaged our services, your project is tasked and allocated to appropriate personnel. While every project is unique, many share some workflow patterns. Typically you will receive feedback and interim graphics from us throughout your project; these serve the dual purpose of allowing you to review progress and fine tune specifications if required, which in turn allows us to produce and deliver exactly what you require. It is often the case that initial visualisation of your own data will reveal patterns you had not foreseen for example, perhaps requiring an adjustment of initially specified page size. Similarly you may prefer a different set of colours for your data than the ones we may choose initially. When we communicate with you during this period, we will only ask you to consider aspects of immediate relevance to fulfilling your requirements; sometimes a single point is all that needs consideration, other tasks may involve review and consideration of a suite of options. We know you are busy, but if we communicate with you, it is for good reason; please read any e-mail we may send to you in it’s entirety, and review any embedded / attached / or downloadable graphics prior to your reply. Often, we cannot proceed further until we receive your response, so please check your e-mail in box regularly once your project has commenced. If you will be unavailable for a period, please either inform us of your expected return date, or brief a colleague and provide us with alternative contact details so we can progress your work in your absence. N.B. Please add “*@mapmakers.com.au” to your e-mail safe-senders / white list(s) to ensure communications from us are not interpreted as spam or junk. Each custom job is different of course. Typically though, 80% of the mapping projects we implement result in invoices from MapMakers Australia of between A$500 and A$3,000, plus data costs if applicable. As specified in several locations on our site, third party data costs, if required, are beyond our control and become the subject of separate arrangements between you the client and the third party supplier. Rarely a custom map can be created for less than A$500. Sometimes highly involved map series, data analysis and extraction, or custom installations with on-site and support work can be more costly, but these are unusual. But we only want a small, basic map..! So it is with every custom map. Every single thing has to be assembled from raw, unformatted data. The amount of work involved (and thus the dollars) bears little relationship to the size of the map you require. All custom maps are created using digital data. We will use the data sets optimally suited to your specifications, but these do not have anything to do with the size of the map you want. See our “quick tour” for an introduction to digital data, scale and other things which directly influence your job. It is often a more difficult task to generate a map suitable for viewing on a small page than a large one. It is common therefore that a specification requiring A4 or A3 output will take more work than the same objective destined for a large format A1 or A0 page. Of course if you’d prefer to do this yourself, you will need the appropriate GIS Postcode Data Product and a suitable GIS Software application. Sometimes a map requires use of commercial – often state or territory government – third party data. If this is unavoidable for your particular map, we will arrange for the data supplier to invoice you separately for such data. That means that you pay a minimum for your required data – we DO NOT take a cut of third party data costs. It has been a long standing company policy to continue to lobby for cost-free access to and use of the spatial data created using your and our taxes. Regrettably in Australia, most State and some tiers of Commonwealth government still attempt to supplement their treasuries by charging us to access data for which we have already paid and continue to fund. While the cost of data from many government agencies has reduced significantly over recent years, there is almost always a cost for data which is of good quality. So don’t get mad with us, lobby your State and Federal Members of Parliament! Tabular output only - if you don't need a visual.. If your project requires use of our Postcode Data to generate tabular output, rather than actual maps or supply of the digital Data Product, the rate is 80%* of the listed GIS Data Product price. Update Service is not available for data accessed for tabular output. *Our 2018 20th birthday sale halves our digital GIS data prices. Tabular only prices remain the same, requiring an increase in the percentage rate from forty to eighty – still a really great deal! Pages are most often measured in standard sizes, such as A4 and A3 office paper sizes familiar to most of us. The relationship is a simple one and is explained and illustrated on this Wikipedia Page. It’s sometimes difficult to work out what would be the best size for the custom map area you have in mind. A useful check, particularly if you’re interested in part of a city or town, is to refer to a street directory. Have a look at the map index page (often inside the front cover), locate the approximate positions of your north, south east and western most points you require, then count the number of map pages required to cover your area. If your street directory has A4 pages and it requires eight pages for your area, aim for a page size about eight times the area of one A4 sheet – that would be an A1 size map which would allow a similar level of detail as present in your street directory (there is often none-map content on street directory pages, advertising for example, so it may be reasonable to aim for next smaller page size in such cases). You may also be interested in how map scale and page size are related. For large maps intended to for wall mounting, the first step is to measure the wall. We can then work out an optimum layout for your available space and geographic area of interest. Multiple pages are usually the best solution for these applications. This is because large format printers provide high resolution and thus good levels of detail. While advertising hoardings and promotional banners can be printed on very large single sheets, they are intended to be viewed from distance. Their resolution is low in “dots per inch” terms. If a map is printed in this way, when viewed closely you will almost always see the printed colour dots, and not the detail a map is usually intended to reveal. The method does remain an option though. For illustration, if you require a physical map showing street level detail for one of the major metropolitan cities, you would need a very large wall! Such maps typically need to be between 5 and 10 metres along each edge – you would need the equivalent of a billboard to physically display it! Please visit our “Big maps..” blog page for illustrated examples of making large maps and large maps to fit specific dimensions. Paper maps compared with digital maps. All modern maps are created initially using sophisticated mapping software in a computer environment. If an actual paper map is desired, as often it is, it is produced after the digital version has been created and as such is an additional cost. Therefore, a paper map is almost always more expensive than an electronic map! While you can print an A4 and increasingly an A3 map on your own office inkjet or laser printer, larger pages require use of large format colour plotters. We use commercial printing services to generate large format paper maps. Prices have fallen a lot in recent years and a typical A1 or A0 paper page will cost between A$30 – 40. Unless you want a large number of copies (over 100 copies typically) there is little scope for multiple copy discounts. For reasons of economy, we strongly recommend clients who wish to have physical paper maps, to take the digital versions we create and then use your local high street / contracted printing firm to run off the paper versions required – it will be much less expensive for you that way. We can supply your maps in pretty well any standard electronic format including Adobe .PDF® or Illustrator®, just about any image format and of course most GIS formats. Please be clear about the formats you wish to receive and ensure your own equipment (computers, printers) can handle both the format and often very large files involved. We will happily work with you to address any issues you may have utilising your output, and can configure your products if you have specific requirements, but cannot be responsible for any incompatibilities or system weaknesses in a client’s system. We have found using common operating systems and popular tried and tested hardware to be a sound investment. Security of your and our precious data and intellectual property is taken seriously at MapMakers. All data we communicate to you via e-mail or download will be encrypted to at least 128-bit Advanced Encryption Standard. This currently requires WinZip version 14 or later (search for Winzip..) for you to extract the contents of encrypted files we send to you. We will not risk your or our own data integrity and security to insecure transmission – Internet use comes with risks and our policies are intended to minimise them. We do not have any relationship of any kind with third party software vendors including WinZip. If you use a utility incapable of extracting contents so-secured, we will happily create a secure executable file, which will not require you to have any enabling software on your own computer. All our stock products are supplied in this fashion. However for files which could otherwise be transmitted as e-mail attachments or via download, but are requested as executable copy on disc, an additional executable creation and shipping charge of $50 plus GST will apply. Most computers in use are still Windows based. If you are using a Mac you may not be able to run the default executables we use to distribute products to you. Please advise us in advance if you only have access to Mac machines and we will work with you to arrange an alternative delivery method (if possible it is a good idea to have either a separate Windows PC available, or a Mac set up with a virtual Windows operating system, this will greatly assist during such exchanges of data). Some customers require a “draft” or “example” before making a decision to proceed. We are happy to accommodate such requests, but ask that you proceed to our Terms and Conditions page. Draft maps are explained fully on our Terms page here. A draft map takes time and competes with other commercial tasks. If your need is specific (often it is) you must pre-purchase custom mapping (Dft_CM1) in blocks of 30 minutes ($87.50 + GST) using PayPal via our web-cart; a MapMakers Tax Invoice is issued for all PayPal transactions. If you require a draft map based on readily accessible data, for example using a sample of our postcode data, it will rarely cost much more than the standard project initiation charge of $175 and you will get the prompt service you need. However should you wish to visualise a sample of your own data, it will almost always take longer than an hour to prepare, so please plan for that possibility. We also have a number of generic sample maps in Adobe Acrobat PDF format for illustrative purposes, which can be downloaded, free of charge. This is a commonly asked question. It is actually a challenge to do this on a single paper map because most postcodes are concentrated in larger cities – its where most of us live – but those places take up a very small proportion of the whole country. Even on a big poster it means the labels for city postcodes must be tiny and therefore hard to read. To get around this we use “insets” which show cities and other populated places at larger scales in map windows around the main map. You can see examples for individual states on the PDF map series page. The best way to do this is with a digital map, which allows you to zoom in and out to any area whilst still maintaining detail and useability. Our GIS data series is designed to do this. While you would get the most flexibility by using these products with digital mapping software (see our digital mapping tour), they can also be used in Google Earth, which is free and may meet your needs. If you simply must have postcodes for the whole continent on one map, we do have a range available. These are full colour poster size maps (A0 or B0), you can read more about them including illustrations, options, pricing and delivery on the Paper Postcode Map page. Give thought to exactly what you want in advance. The clearer and more complete your instructions, the more effectively we can generate exactly what you need. A single draft should ideally be all that is required for a well thought out project – it will really save you money! Even small changes require work so please be as specific as you can. We can have a good guess at what you mean if you say “..just a basic map..”. But everyone’s idea of a “basic” anything is just that – individual. So please help us and save yourself money – be as specific as you can! Give a few people a large Australian map showing state and territory borders, but otherwise blank. Ask each to draw the boundaries of a few major cities or regions (“The Illawarra” is usually interesting!) on the map. The results will probably be surprising – while there will be some similarities, there will be big differences. Our perceptions are very individual, and other than state and territory borders, there are few other rigid boundaries which we might think of as “fixed”. If you are confining your interest to a few cities or regions – very common – please download a copy of the map below, it’s the best reference to “standard regions” we’ve come up with to date!. 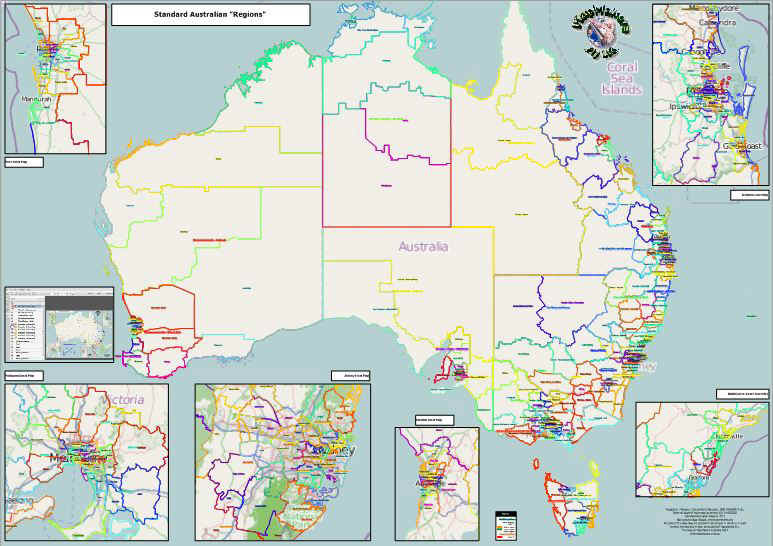 Our “Standard Regions and Region Names of Australia” map; it is poster size (B0) in universally readable Adobe PDF format (c.50MB download) and may be a useful reference when specifying your “area of interest”. This and other sample maps are available on our download page. Tech tip: this is a layer-enabled map showing standard regions separately at both large and smaller scales. Adobe Reader has a handy “layer” function to allow you to filter only data of interest – there is a “how to” screen shot included with the map – it’s just offshore from Perth (you can turn that off too, using the layers pane)! Update: we have added a text-searchable version of the map to allow you find regions you may know by name. The data is identical but the region labels are searchable using the Adobe Reader “find” tool – it doesn’t look quite as nice as the default map, but we thought some of you may like to have this option – why not download both and spoil yourself for choice! The text searchable version can be found at this link. Your own custom Draft Map can be initiated here, and you can also purchase the MapMakers Ideal Address Format Template..
A draft or example map takes time and competes with other commercial tasks. If your need is specific (often it is) you must pre-purchase custom mapping (Dft_CM1) in blocks of 30 minutes ($87.50 + GST). A Custom Draft will typically take an hour (2 * Dft_CM1); please include a summary of your requirements in the “message” section. Include contact details or send an e-mail to support so we understand clearly what you require. MapMakers Ideal Address Format Template IAF_001 (Microsoft .xls format) contains suggested structure and detailed notes for standardising and correcting common errors in address data in order to maximise the chance of records returning accurate geographic coordinates. Processing your records to make them mappable is a custom mapping task charged at our normal commercial rates. Please note, this process can only be successful for street addresses which have gone through formal government protocols of gazetting and from there incorporation to the address database(s) used – a process which is variable but usually takes many months from construction at a green-field site to appearance in an address database.